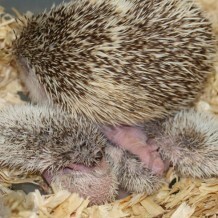 Baby hedgehogs are called hoglets. Hedgehogs can produce litter sizes ranging from 1-9, with the average litter size being 3-4. The gestation or the amount of time from conception time until birth is typically 33-35 days. The average recommended breeding age is six months. Babies are born with soft clear spines that turn brown in 2-3 days. Weaning occurs at average of 5-6 weeks but can take a little less or a little longer for babies to mature.